University of Louisiana Monroe President Dr. Nick Bruno presents the annual State of the University Address Thursday at Brown Auditorium. “This is my sixth State of the University address, and it’s the most optimistic of all,” Bruno said. The University of Louisiana Monroe is on a roll. That was the message ULM President Dr. Nick Bruno shared with the crowd Thursday at Brown Auditorium. “This is my sixth State of the University address, and it’s the most optimistic of all,” Bruno said. 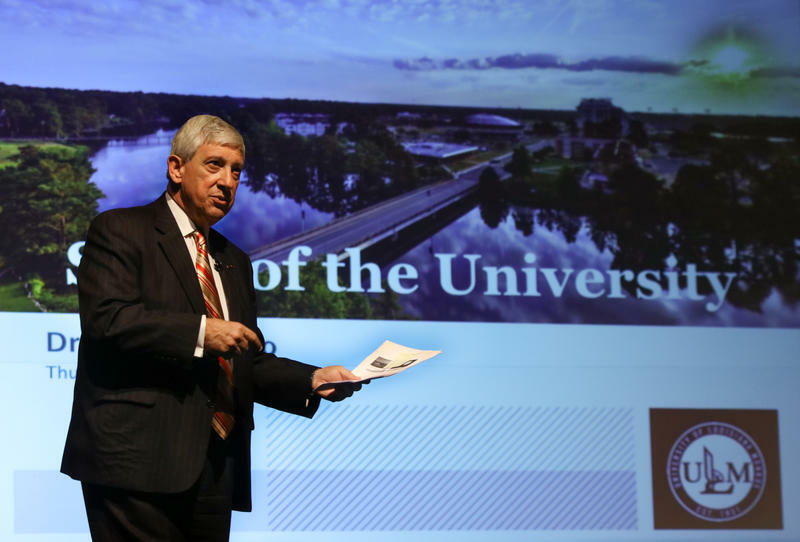 Bruno’s address pointed to progress in academic programs, enrollment, hiring and budget. Bruno said the answer, at least in part, is through growth. Larger enrollment means more income. “We will be looking at all our existing programs and see whether they are growing,” Bruno said. Another significant piece of the growth puzzle, Bruno said, is new programs. Among those ULM recently added are adult-gerontology primary care nurse practitioner, gerontological clinical nurse leader, a Master of Arts in Communication online, post-baccalaureate accounting technology and a juris doctorate/Masters of Public Administration in partnership with Mississippi College. The university hopes to bring back chemistry and add a doctorate of physical therapy. “We will be the third physical therapy program in the state in a field where the demand is ridiculously high,” Bruno said. This summer the Board of Regents approved a partnership with the New York Institute of Technology to house a branch of its College of Osteopathic Medicine on the ULM campus. The expected increase in enrollment the new programs should bring would augment the current trend line of growth. Preliminary numbers for the fall 2017 semester show an estimated increase of 194 students. If those numbers hold up, Bruno said, enrollment at ULM will be 9,309, the third year of growth and the largest student body this decade. A rosier budgetary picture has allowed the university to hire 40 additional faculty and 40 additional staff employees, so that ULM now has about 400 in each classification, Bruno also announced pay raises were working their way through the system. The 2017-2018 budget of $92.1 million sees a 5 percent increase from the state and a 2.3 percent increase in self-generated funds. As enrollment grows, retention will play a vital part in making ULM more independent of state budgetary restrictions, Bruno said. For instance, a 5 percent increase in retention between last year and the upcoming academic year has put an additional $1.8 million in the budget. There is room for improvement, Bruno said. The graduation rate in 2017 was 42.5 percent, the same as the year before. “Retention fluctuates year to year, but we can’t let our guards down,” he said. He challenged all in the room to mentor and guide students, so that in six years, ULM can see an increase of 400 graduates. Renovations to the University House, used to house guests, are completed. A new fountain has been installed in Scott Plaza outside the library. Construction continues on a Student Events Center which will give ULM a larger space “for gatherings for activities we can’t handle now,” Bruno said. Renovations to Brown Stadium and Groseclose Track into a state-of-the-art facility for the track and field team and soccer team. The installation of some 1,000 security cameras, outdoor LED lighting and the paving of some parking lots. Bruno gave a tip of the hat to the athletic department, whose student-athletes boast a 70 percent graduation rate. He praised ULM’s ski team for its 27th national title and the women’s tennis team for winning the Sunbelt Championship. Football fans should be encouraged by ULM’s recruiting efforts, with the incoming class being among the Sunbelt’s strongest. Bruno, in recognizing some of legislators and city officials in the crowd, reminded all in the room that ULM’s reach goes beyond campus. The university’s health sciences program provides $19 million in services to the community, serving 44,649 clients; $1.4 million in business services to 308 clients; and 3,119 internships valued at $20.6 million. More than 126,000 people attended sporting events and 84,161 people attended arts and cultural events on campus. “We have to remember we are a citizen of this community. We are a landing site for the community. And we have to remind the community what our impact is,” Bruno said.